This was asked a couple of times. "Are they both girls?" I want to tell them no, I like to dress my son like her. (haha) I look at them like are you kidding. Comments for Aww, twins. Are they both girls? Mine are boy/girl and my boy is generally in blue or sports or dinosaurs etc with a blue blanket over the carseat and my girl in obviously girl clothes (not always pink) with a bow or at least headband and pink blanket over the carseat (matching neutral carseats)and I still get "oh 2 boys/girls?" sometimes I want to ask them if they're blind? 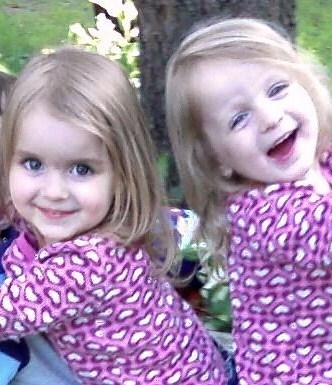 When I was asked if my twin girls were both girls at first I would always respond yes and laugh, but after about 3 months of it I got tired of it. One evening we were out to eat and an older woman asked the question and without thinking I said " no it was buy one get one free on the pink carseat so I decided my son could ride in a pink one for a few months." The woman walked to her table and shook her head and said to her husband "kids these days dont even care, its all about whatever is cheaper!" I have actually had people ask if it is a boy and a girl with both of my daughters dressed in pink dresses with bows in their hair and ruffled pink blankets. I said no it is two boys, but the ultrasound said it would be girls so they have lots of pink. The woman looked horrified, but my husband just started laughing. Please there are just some questions common sense should answer for you. Oh my goodness, I get asked that all of the time of my girls, and everything they have is very girly (pink, with hearts, flowers, etc...). I smile and say yes, but sometimes I feel like saying no just to see what their reaction will be. I get the same question with my girls. They will both have BIG bows in their hair and still ask "are they both girls?" What is wrong with people! ?